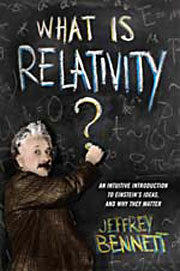 The full title of this layman’s guide to understanding the theory of relativity is What is Relativity? : An Intuitive Introduction to Einstein’s Ideas, and Why They Matter. Published by Columbia University Press, author Jeffrey Bennett uses his young adult, classroom lectures to aid in understanding the profound equations and theories that revolutionized our picture of how the Universe works. I’d like to write that this is a welcome addition to the field. I can’t. There’s nothing especially wrong, or inaccurate, about this volume, just that there’s nothing new or original about it. The gold standard of books explaining Einstein’s theories of relativity has — at least for me — been The Universe, and Dr. Einstein, by Lincoln Barnett, first published in 1948, and revised in 1950. Long out of print, but used editions readily available on eBay and other sources, it clearly made relativity accessible to the average reader. While Einstein (and Barnett, in explaining Einstein’s work) use railroad trains as illustrative examples, Bennett has updated that by using rocket ships, instead. Other than that, the book adds nothing new to the discussion. On the plus side, he does give an original view of black holes, and what could happen if a spaceship ventured too close to one. On the minus side, he does little to illuminate the conflicts between the theory of relativity and the quantum theories. Barnett’s book touches on that, a bit. Bennett’s writing style is okay, though not exciting, and the illustrations are nothing special. Although Barnett’s book is out of print, might I instead recommend to you, Einstein’s Cosmos, by Michio Kaku, which does a much better job of presenting — at a ‘consumer level’ — both theories plus Kaku’s typically interesting speculations.